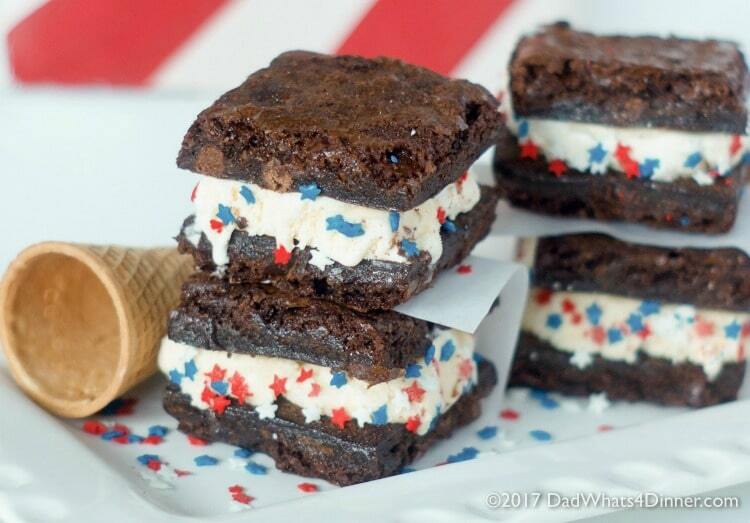 These Ghirardelli Brownie Ice Cream Sandwiches is the perfect treat for summer. 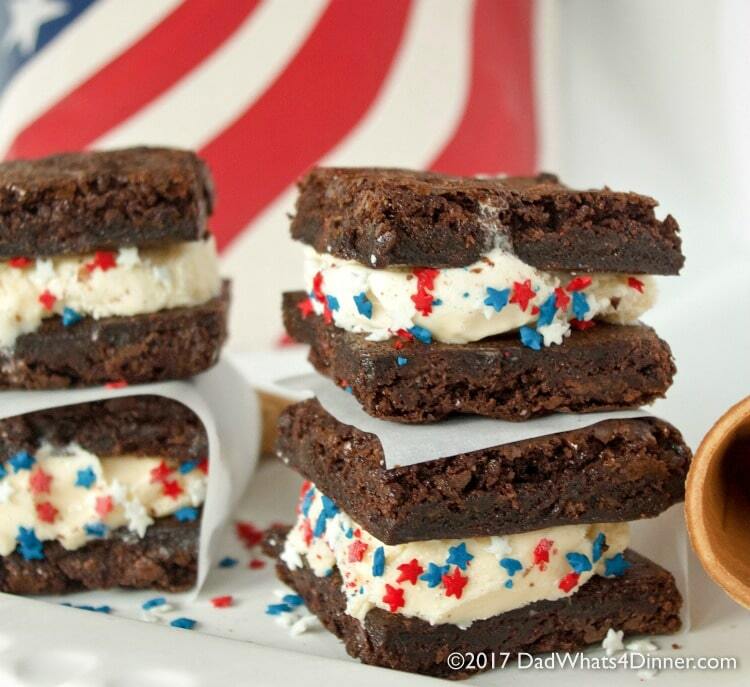 Decadent triple chocolate brownies stuffed with cool vanilla ice cream! Summer break has just begun and one of my kids is already bored. Since Ethan graduated this year, we never see him between work and his girlfriend. I am so proud of Emily, my 14-year-old because she started her first real job at Kroger’s. I love that Kroger’s hires young teens. She is also babysitting. But then there is my Ella. Ella is my guest poster on the blog and is usually always busy. But this summer, as she becomes a teenager at the end of summer, she has started to act like one. Sleeping in and laying on the couch all day. This does not make her dad happy! Starting next week she will be very busy with summer camp at Springhill and when she gets back she will begin summer gym class for 4 weeks to receive school credit. I guess I should not be too upset with her. So yesterday I suggested that she cook something for the “Cooking for Ella” page on this blog. 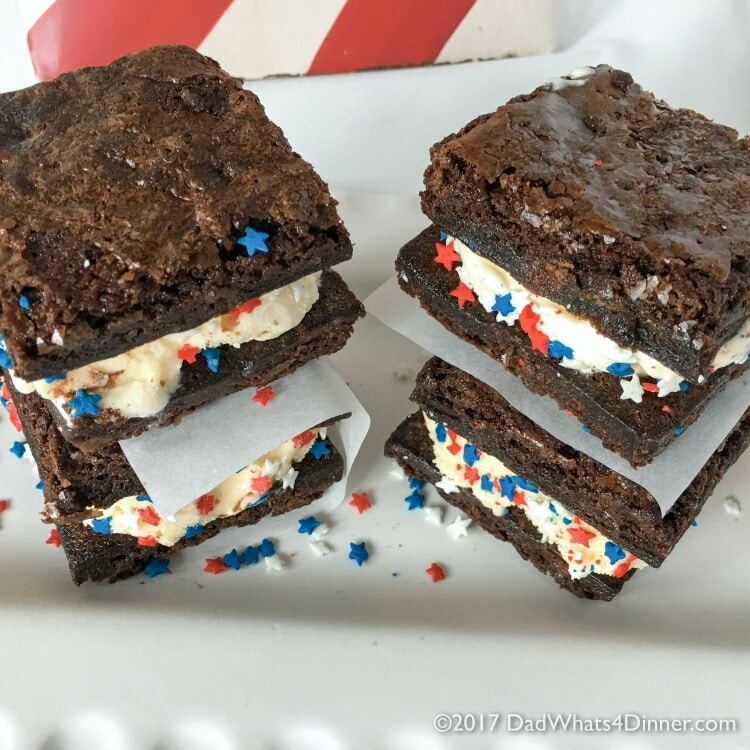 She decided she wanted to make brownies and I suggested she make these Ghirardelli Brownie Ice Cream Sandwiches. Luckily she thought this was a good idea. We had Ghirardelli® Triple Chocolate Brownie mix from Costco in the pantry, plus the rest of the ingredients on hand, so she was off and running. Ella loves to cook and bake, just like her dad. Hopefully, this continues even as she becomes a beautiful teenager. 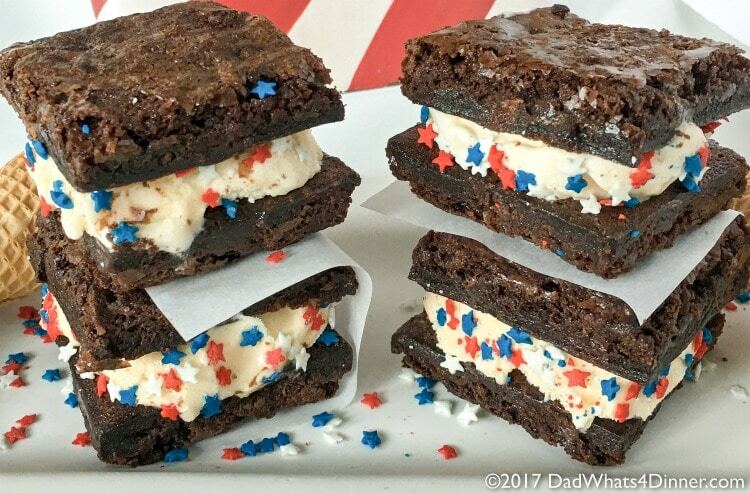 No need to run out to the Ice Cream truck and listen to that stupid music when you can make these yummy Ghirardelli Brownie Ice Cream Sandwiches at home. Just like Ella, your kids can make them too! 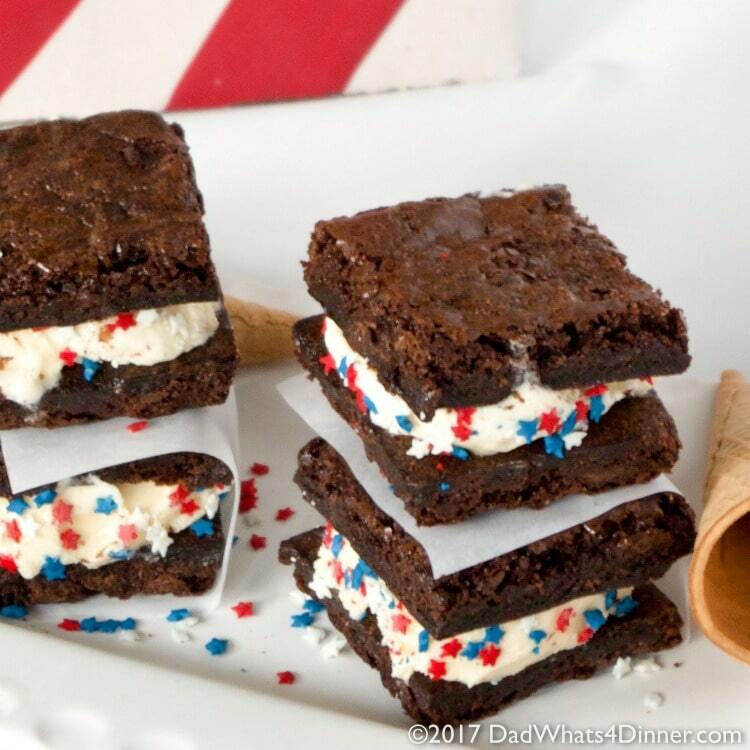 As you can tell they would be perfect for July 4th!!! What is your favorite ice-cream dessert recipe? Heat oven to 350ºF. Line a 15 x 10 1/2 sheet pans with parchment paper, leaving a 1-in. overlap on each short end. Spread brownie mixture evenly in prepared pan. Bake 25-30 minutes or until wooden pick inserted in centers comes out clean. Cool completely. Cut into 24 equal brownies. Freeze for 2 hours or until firm. Line a second 1/2 sheet pan with parchment paper or aluminum foil. Remove brownies from freezer and invert onto prepared sheet pan. 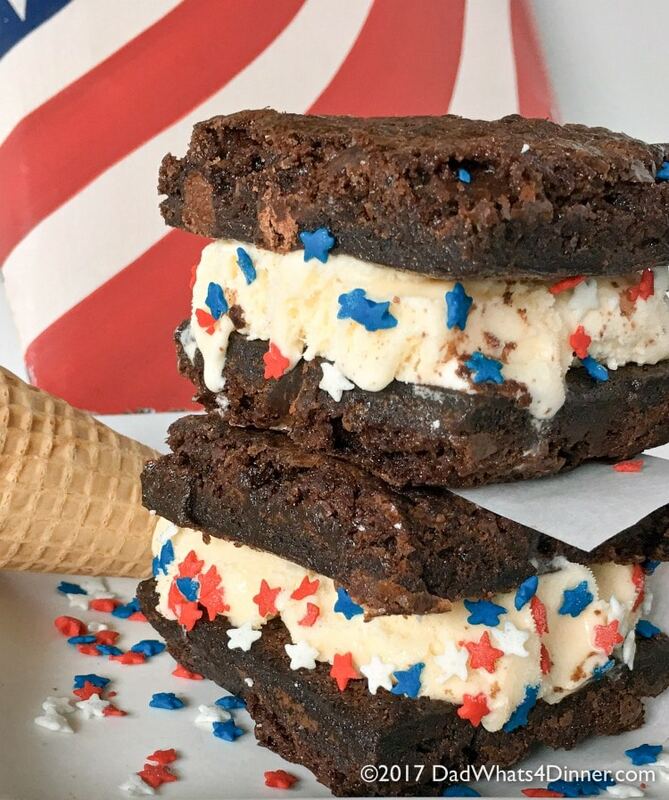 Place one large scoop of ice cream on half of the brownies. Top with remaining brownies squares. Freeze 3 hours or overnight until firm. Wrap each sandwich individually with plastic wrap and freeze until ready to eat. Total time does not include freezer time. 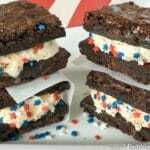 I will be bringing Ella’s Ghirardelli Brownie Ice Cream Sandwiches recipe to Fiesta Friday and Weekend Potluck. 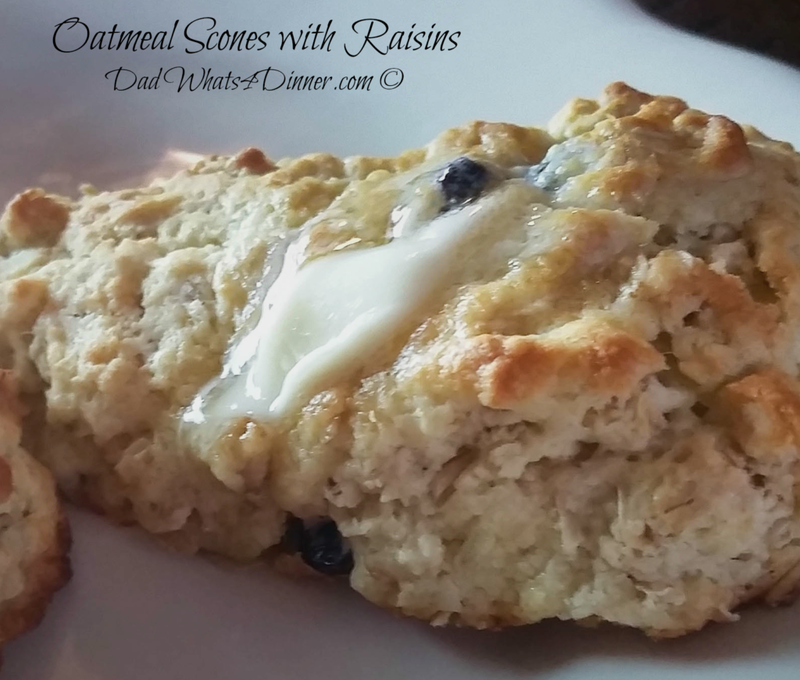 ,Checkout my Link Parties page for other great places to find new recipes. What a delicious dessert! I love this idea for celebrations this summer! Good choice Ella!! I’m in love with these sandwiches. 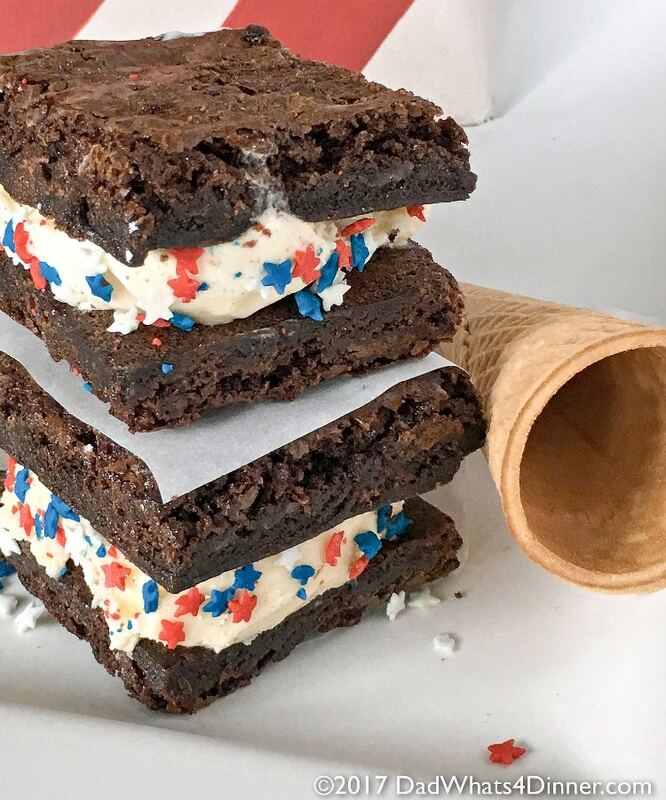 You can’t go wrong with brownies and ice cream. 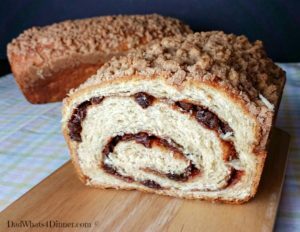 An ideal dessert for summer.Looks delicious! These look so cute and delicious! Thanks for sharing them at Talk of the Town at Knick of Time. 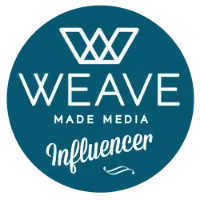 You’re my featured blogger this week! Thanks Angie for the feature. Looks fabulous! I would surely be sneaking them out of the freezer daily. Thanks for sharing!